Many popular diets call for avoiding some foods or eating others exclusively. But as The Good Karma Diet reveals, the secret to looking and feeling great is actually quite simple: Treat our planet and all its inhabitants well. In this revolutionary book, bestselling author Victoria Moran reveals that by doing what’s best for all creatures and the planet, you align your eating with your ethics—a powerful health and wellness tool if there ever was one! This book also includes the inspiring stories of men and women across the country who have made this simple mealtime shift and reaped “good karma” in every aspect of their lives. Follow this wise diet and lifestyle program and you will find yourself waking up in a good mood more often and having a luminous look that bespeaks health and clean living. Victoria Moran is the author of twelve books, including Main Street Vegan: Everything You Need to Know to Eat Healthfully and Live Compassionately in the Real World and Creating a Charmed Life: Sensible, Spiritual Secrets Every Busy Woman Should Know. An obesity survivor, certified holistic health counselor, and much-sought-after speaker, Moran hosts the Main Street Vegan podcast on Unity Online Radio and directs Main Street Vegan Academy (mainstreetvegan.net), training vegan lifestyle coaches and educators. "Be good to others, get good back. Eat beautiful food, create a beautiful life. This is kitchen table karma, the sweetest and simplest kind, elegantly presented by Victoria Moran, who knows from experience that a little produce and a lot of love can change, well, just about everything." "Every one of Victoria Moran’s marvelous books helps people, animals, and the earth. 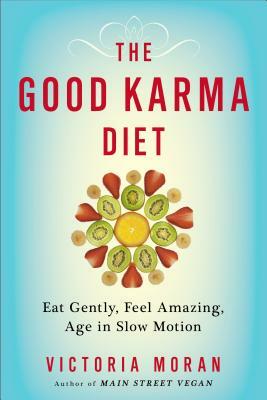 The Good Karma Diet is no exception—it’s eminently readable, highly informative, and wonderfully useful." "Victoria Moran is an inspiration to all who know her and The Good Karma Diet gets the formula right: combine food that's full of life, a heart that's full love, and expect to experience joy, vitality, and beauty at every age." "The Good Karma Diet shows you why it's in your self-interest to care about animals and the future of this planet. You feel better and avoid the ills plaguing American society, like heart disease and obesity. We all win a better world. And, good karma is delicious." "Inspirational and thought-provoking. A profound and uplifting book that just may save your life."